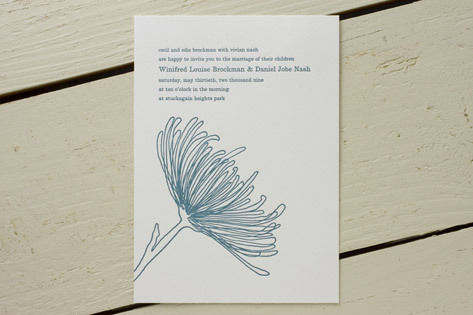 A single, stylized mum embellishes these modern letterpress wedding invitations, exclusive to Minted. Clean, classic typography enhances the stylish tone of these invites, setting the stage for a modern wedding celebration. Available in storm (shown), terra cotta, olive, brown, pumpkin/grey, and grass/grey. Font shown is Garamond. This design has been discontinued, but you can see additional invitations and announcements from Minted by clicking here.